Hello, everyone. Welcome to another issue of Predicting the Turn. Today I'm joined by actually two of my favorite people in the world of business. They are up from respectively Atlanta, Georgia, and the great city of Louisville, Kentucky. 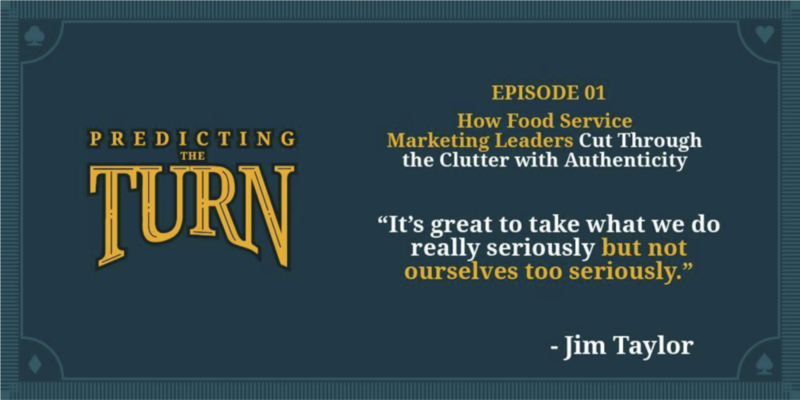 Joining me today is Jim Taylor, who is the Chief Marketing Officer of Arby's, and Jason Loehr, who is the Vice President of Media for Inspire Brands, which is the parent company of Arby's. So, welcome, Jim and Jason. You're making me blush with your kind words over here. The least I could do. So, we're live today, actually at the Brandemonium Conference here in Cincinnati, where we're going to have these guys taking the stage later on today, to talk about the remarkable story that really is Arby's, and everything that's gone on with that business. So, I'm lucky enough to have them to talk about the world of innovation, though. So, what I want to do is start off with Inspire Brands. That's a name that a lot of people might not be familiar with, but actually a portfolio that includes Arby's, Buffalo Wild Wings, Rusty Taco, and now a recent deal that had you acquire Sonic. Combined, that means you have 8,000 locations, and combined sales of $12 billion. So, what's the history that led to Inspire and what you guys are working on today? Yeah, I mean, it's really exciting. Our CEO, Paul Brown, has a vision for us to be the largest restaurant company in the US. And to be a company that continues to be driven by the things that drove Arby's success in terms of being innovation driven, and always focused on what we can do to differentiate our brand versus competition, and make Inspire an employer of choice. You know, from the team members that interact with our guests every day, to the folks that we have supporting all of those people, back at headquarters. And creating a really special culture that can drive that engine of innovation. So, it's really exciting to be a part of. I was part ... Fortunate enough to be a part of Proctor and Gamble. And of course, huge portfolio, biggest portfolio of consumer brands and software, and the power that that scale can bring to driving growth. And we're expecting big things, and more things to come from Inspire as we continue to advance toward that vision. Yeah, and you know, it's interesting when you look at Paul Brown, our CEO's background with Hilton Hotels, and very familiar with the whole house of brands environment, and knowing that you can build some great efficiencies and as a result, grow the brands both individually, but then as a whole, get an even larger impact. And I've ... Similar to Jim when it comes to looking at the backgrounds of those house of brands, I spent a lot of time at Brown Foreman, and looking at that global footprint and all those brands that are trying to do similar things, that are slightly different, but still trying to gain from the overall good. The thing that has struck me, because I've only been with Inspire for about six months now. There's a ... When you look at the culture and the principles that Paul and the team, that we've laid out, there's this notion of mavericks, which is probably my favorite part of as we look to the culture today and where it's going, and it's the idea of doing things that others haven't. And trying to forge ahead in areas that people haven't been successful, or maybe haven't done it the same way. And that part has got a lot of interest, especially for Jim and I. When we look at what innovation means for the company, I just love having that as a key tenet that we can always speak to. That's awesome. Well, so speaking of that word innovation, Jim, you joined Arby's in 2014. Dave Knox: ... To lead product development and innovation. And you once told me that your job at the time was to make sure the menus lived up to the we have the meats kind of slogan that was coming out. So, how did a classic CPG guy, who I met when you were selling Old Spice deodorant, end up in charge of the menu development for a quick service restaurant? Well, I'll tell you what, it all kind of started ... I loved my time at P&G, but my last assignment was on Metamucil. And I've always been passionate about food, and it just struck me at some point, that it would be more fun to create problems than to solve problems in a world of food. So I jumped over to Darden Restaurants, and really learned the business. I mean, it's a retail business, it's a fast-paced business, and it's one that's all based on guest experience, which excited me as a marketer. You know, to get to touch not just the advertising and the media, but how we brought the brand to life in the restaurants. And I happened to work there for four years, and then I get a call from Rob Lynch, who I knew from back in P&G days, who was the CMO at the time, and I was blown away when I came to visit Arby's and saw firsthand the culture that they were building, and how they were building a company based on continuous improvement and innovation, which is exactly what turns me on. And I love food. So, you know, I came there with a mission, to say, wow, how do we bring food experiences to the world of fast food, which is dominated by hamburgers and chicken, and bring these interesting things that just surprise people that we even offer, and even more so when they taste them? How on earth do you do a 12 hour smoked brisket, 13 hour smoked brisket, in about two or three minutes through a drive-through, that tastes every bit as good as any barbecue joint? And so, that's what drew me to it, and it's just been a great ride to work with people that really take what we do really seriously, but not ourselves too seriously, we like to say. And have a lot of fun along the way. Love that. So, talking about taking yourself not too seriously. So, we have the meats has been one of the most famous kind of classic campaigns of the last few years. But you guys gone a lot further than beyond that core campaign, generating all kinds of buzz, by being mavericks, as Jason kind of indicated. You grabbed headlines originally with telling Pharrell that you want his half back. That was a great moment. Dave Knox: You ran a brutally honest apology ad for Pepsi, for forgetting to, frankly, do enough marketing with them, that you signed up in the contract. Exactly. And then recently, you landed in the Guinness Book of World Records for the world's largest ad and the world's smallest ad. What has drive you to kind of think about those worlds of classic media campaigns mixed with buzz, to really get kind of the Arby's mojo back? You bet. Well, it's a core part of our strategy. You know, we can't compete on spending, dollar for dollar with the bigger guys. But what we think we can compete on is having a really differentiated, interesting tone of voice that can cut through the clutter, and entertain people. I mean, there's certainly a lot of effort we devote to getting guests in seats and in cars through the drive through. But we also put about an equal amount of effort to figuring out how we can engage people, and just show the human side of the brand. Show that we understand what their passions are, and are fellow fans along with them. And also embrace imperfections. People talk a lot about authenticity, and I don't think there's anything more authentic than actually owning some of your imperfections or shortcomings, and being willing to have the confidence to be comfortable enough in your own skin to say hey, this is who we are, and hey, we messed up here and we know. For example, we did the Jon Stewart thing too, where he made fun of us for years, and we just played along with it instead of push back, and that led us to an opportunity where on the final week of his airing, we actually bought a commercial that got a lot of publicity, thanked Jon for making fun of us for all those years. As someone that we'd miss, even though we're not sure why. So I think just that spirit of, again, taking what we do seriously, but not ourselves too seriously, has allowed us to do brand activations that help us fight above our weight. And it's one of the parts of the job that I just enjoy the most, is to figure out how we can, not really create conversation, but figure out what are the conversations that we think we can plug into and have a point of view on, and that people will engage with. Yeah, that knowledge itself is huge. Because when we know who we are, it makes the filter for what we feel this works, this doesn't, so much easier to be able to manage, too. Because we know who we stand for, we know enough about ourselves and what that conversation is in culture to know this would work and this won't. And frankly, that's ... You know, the word authenticity is thrown around a lot, but I think a lot of that goes back to knowing yourself really well as a brand. And it's hard to do. And it's taken a lot of time to get there, and it's nice to be in that position. And we're starting to do the same with the other brands in the mix, especially Buffalo Wild Wings right now. Love it. So, switching gears a little bit. Predicting the Turn is all about how industries are changing, and both the opportunities and the threats that that creates. When you look at this world of restaurants and food, what opportunities and threats are you seeing because of the rise of technology, and how has it changed your day to day job? I think that for me, one of the things I'm most excited about, and we have a saying in the restaurant industry that the experience of the guest can never exceed the experience of the employee. And I'm excited about the power that technology has to make the job of our employees easier. Whether it be scheduling, or the job of our general managers, who frankly, is the most important job in our industry, making their jobs easier to forecast their business. To prepare to delight each and every guest that comes through. To give them dashboards that can help them understand real time and overtime, how they're performing on key performance metrics. I think that ... And new ways to train our front line employees, so that they understand why we're doing things and how to do them correctly. I'm really excited about technology's ability to do that, and move from what frankly, five years ago, was a very much a mail a bunch of paper out to people type mindset. And now we're moving on to more ways to connect with people the way they do in social media and chatting and texting and all that. So that's one of the things that I'm really excited about. And the thing that we're running into a lot today is where technology is leading, before there's a solution that's an order of magnitude to actually be able to take advantage of, and I think that we're being a little bit more deliberate. Because there's a business case around things, and also, you're trying to look ahead to see where the consumer's going. And obviously, with things like Uber Eats and Grub Hub and this delivery service and online ordering, it's making sure that the context fits. Because when you think about it, Arby's, they're a 3,500 apps around the US. Because I can go in, I can go to the drive through, I can get my brisket, I can get my Coke, and then I can go out. And I'm there in a very short amount of time. So the convenience factor there is huge. And I was just in another QSR store recently and saw the ... And did one of the kiosks. And I go up to the kiosk, and it's a fairly busy time. By the time I get through the kiosk, ordering my hamburger with ketchup only and whatever, there's four people that have gone through the line next to me. So, I think that the disruption is happening, but it's an order of magnitude piece that we're looking out for. And for us, it's also just the business model. The optics on it are there, but the metrics aren't exactly there. So we're trying to strike a balance with that. And the knowledge and understanding of that first party consumer data is where technology is helping us in a big way. And that's what, for my world in particular, where we're aggregating all these media touch points across the brand, there is great wealth of information to find from that. So that's where technology is helping us to identify spaces to potentially play in, but it's going to take a little bit of time for some of these to come to light. So, I want to double click on that. One of you leads media, one of you leads marketing. Yet the first thing you both talked about were customer service things, employee, HR, engagement, store operations. How is the role of a marketer changing today, that is broadened, that it's not just fine fancy 30 second ads any more. Dave Knox: How do you think about that, and what your role in the two leadership seats you have? Talent is a big part of Predicting the Turn. And as we talk about talent, I wanted to mention one of our sponsors. Hunt Club. Imagine the power of the best marketers in the world helping you to find your next marketing leaders. That's the power of Hunt Club. Hunt Club is a new category of talent company that powers the network of experts, connectors and business leaders, to help you find the best talent. Let's face it. Recruiting hasn't changed with the times. Hunt Club is changing the recruiting game by leveraging technology and crowd source referrals to find you the best people possible for your company. Stop paying job boards that don't work, or recruiting firms that recycle the same active candidates. Partner with Hunt Club. Sitting at the center, it's the POVs of Inspire, where we're looking at it from a holistic point of view as to what is the best thing individual brands are doing, and then working with Jim and the Arby's crew, it's hey, we have got to move this number up, and this trans here, and all that. So it's the macro and the micro that are key, but there are so many points that go into that. Because, from a media standpoint, I'm driving a ton of traffic in store. The impacts of that on labor, on actual product and all the touch points that go into the actual supply chain, and then actually when the consumer comes in the door, there's impact to that. So I have to be aware, to know that if we're doing these things to drive more butts in seats, that there are impacts of that beyond my world. So I have to have a visibility to that. So I feel very fortunate that Inspire has embraced what media is, because it is our largest spend. I mean, when you combine our three brands at the top, there's a lot of, lot of outlay in costs there, in investment. So we have to have an understanding of that visibility, and that's where I feel like, as we continue to grow, we're going to lean into that heavier, and understand that there's kind of that T-shaped individual, from a marketing standpoint, where you have to know all the areas very well, and you might go deep into one category, but you've got to really know the whole space overall. Yeah. And I have to say, I have never seen a business that is more interconnected than restaurants. I mean, ultimately, the restaurant business is about bringing a thousand details together in just the right way, across thousands of restaurants. And the job of marketing or branding, as I view it, is to really own the guest experience across each and every touchpoint. Whether it be outside the restaurant, in terms of how you're trying to drive them in, as well as inside the restaurant, how we equip employees to give every guest a great experience, and what the guest experience is there. So, it's just, it's a lot bigger world. It's a more complex world. But it's one that is so fun to work on. There's so many challenges and opportunities, and we really focus innovation across every guest touchpoint. And you know, that's one of those ... The elements of that innovation that can happen upstream, if the dots are connected downstream. Because obviously, we sit, when it comes to innovation, a lot of things are planned in advance. That consumer experience is being managed by our 3500 stores and the employees that are there, that are average age, fairly young. So making sure that it's actually easy for them to execute is huge. And if those fall down ... So, we can promote something great. So, if I get my two for six heroes, by the time it gets to the store and the experience inside of it fails, that's not a great experience. So we're trying to make sure, to Jim's point, that that's not as connected across the board. And even though I may be looking after media for all of it, I'm very understanding of what that experience is like, and those supply chain implications. Because they all have to work well together. Very cool. So, with Arby's, when you look at the turnaround that you guys have had for that business, it's been pretty remarkable. So, you recently bought Buffalo Wild Wings, you just bought Sonic. When you go in and look at those businesses, how can heritage really be the foundation for a future? Yeah, I think that any good brand refresh starts with really understanding the DNA of the brand, and what made it special from the start, and defining those characteristics. And then figuring out, well, how has the world changed around the brand, the consumers have changed, the competition have changed, and where are things going? And updating it to be more relevant. But making sure it's always grounded in the DNA. And I think, you know, the Arby's story's really interesting, because it was started ... I think is was kind of the original fast, casual restaurant, in a way. In a world of 10 cent burgers, the Raffle brothers introduces premium roast beef sandwiches, sliced straight off the roast in front of you, for four times the price. So ultimately, what they were kind of serving was a fast crafted, premium sandwich experience. So we went back to that DNA when we repositioned Arby's, and said, Gosh, instead of just being about roast beef, we can be about a wide variety of meats. And we can stand for being the meats place, for meat lovers who eat a variety of meats each and every week. And so, I think that's an example of the type of thing that we really believe in. And making sure that you are authentic to the DNA the brand is, while making sure you evolve it to changing consumer tastes and competition. This whole notion of there's fruit in the root, and when you look at the brands that we have in our ... In the family that is Inspire, you look at the core. There is some really strong core values and core experience, but Buffalo Wild Wings being started out, just off the campus of Ohio State, and being rooted in what is sports, and being the original sports bar. The great American sports bar. And keeping that forward. And as we look at the brand, there will never be another 1250 location sports bar nationally. It's just not ... It's not feasible. It's not a thing. Sonic is a similar one. 3500 drive-ins around the US? Probably not going to happen again. Arby's is in a similar boat. So I think that heritage is actually a fairly significant part of what we do to evaluate who comes in next, as far as what the team is looking at to bring as another brand into the mix. That's why there is a good, the bones of these brands are so solid. And it's a matter of what we're doing to help amplify that. And Arby's is the best example of that. And then taking that similar knowledge for Buffalo, and then on the way down to Sonic, which is brand new to the mix, and we'll see what happens there. Great. So, the three of us came from the world of classic CPG companies. Brown & Foreman, P&G. Those businesses are struggling a little bit today. You know, you've got all these emerging brands that are coming out, and their retail channel's shaking up. There's just a lot of change taking place. If you were walking back into those hallways, and getting involved with those brands, what should they be doing? How can they inspire innovation and change, and embrace what's going on? One thought that comes to mind is just evaluating what business they're in or want to be in. Because I think if they keep themselves in a product in a box business, and they don't think about what are the problems and friction points in guests lives that have to do with their beauty routine, or their over the counter health regimen, and thinking bigger picture about how can they add value beyond the product itself. I think that there's probably a lot of opportunity that they walk past, and they ... I mean, retailers have gotten stronger and stronger, it's been really interesting to see them evolve from House Brands being a cheaper knockoff of branded products, and frankly having products that are every bit as good and better, in some times, than the big CPG companies. So I think that would be one of the things that I would go back and do if came in, and really ask ourselves that question of what business are we really in, and what higher order needs are we really trying to solve, other than sell someone a new product. And what business opportunities would that open up? I think that the biggest thing is to get out of their own way. I mean, when you look at the total market effect of a lot of things that are happening, and where we're at right now, if I'm a retailer of spirits, and the implications of things like, you know, autonomous vehicles and all that. There's a lot of that that's further down the road, but there are so many things before that that have to get sorted before that actually can become even viable. And right now, I just ... There's a bit of an ostrich effect, where they're digging their heads in the sand at too much of a scale, and they're fat and happy where they're at. And they're like "Nobody can touch us." And I just ... That hunger for continuing to push where you're at, where you're going, and how we get there. I think that they're moving way too slow. And it's what happens. You know, you get to corporate level, and you get to 10,000 employees or 5,000 employees, and you get a bureaucracy in process, but the faster that you can get out of the way of that, and build those methods to streamline it, it's a critical state right now. Because competitors are popping up all over the place, and that reaction is difficult, versus what you can build as a proactive nature going forward. And that's, I think for us, while we're trying to be as proactive as we can, for the CPG world, where you have these consumer direct products that are just coming out of nowhere, fostering that internally is a huge ... Because the resources that you had, if I was starting a new spirit line inside of a Brown Foreman or Beam Suntory, or Campari, or whomever, I would be encouraging that as much as possible when it comes to what is new and next. And, being able to help get to a what is a business model versus a hobby? And being able to understand how we graduate from hobby to business model as quick as we possibly can. So, both of you, one of the things that's always inspired me is you're students of our industry. Constantly learning, that child-like sense of curiosity. When you look around at brands and companies today, who's inspiring you to go to new heights, and pushing you to be better as marketers? You know, I talk about experience innovation. I will give credit where credit's due, to one of our fellow Atlanta quick serve companies, and that's Chick fil a. You know, they're talking here at Brandemonium Two about their guest experience model, and I think it's a very robust one. And they have made a lot of investments that have been long term investments, frankly, that have paid out and allowed them to differentiate themselves in the space. To be beyond just the food, but have been a place that has an experience that is, if you take a look at any of the key metrics of virtually any data source, is a step above most QSRs. So I think that, you know, I see them continuing to innovate on that experience, and they are, you know, a source of both kind of learning and inspiration, and frankly, a source of competitive pride, that I want to out-experience innovate them, as well. That would be my example. The Stance Socks brand, I think, has been a really interesting one to watch the last few years, where they've really done an interesting thing with the match stuff that they've done, with different brands or experiences or events. And then, what they continue to do on their own, as you see in real time, their expanse ... As they expand their product line, what that looks like for their business model and how it's changing. And I just, I have a lot of respect for the brand. I've followed them from the beginning, just because of what niche they got into, and how they were able to take advantage of it. But they're just ... The creative aspects of it are great. And in addition to that, I just, I love the role of these challenger brands that are coming to market. And just, whether it's an Albert's or it's any of the mattress companies and what they're doing, I love to see folks getting disrupted, and I love competition. And if I was in those competitive spaces, it would be like, Gosh, it's as much wanting to beat them as it is the respect of what they're doing, and how we can bring that into our own. And that's similar to what Jim was talking about with Chick fil a, where there's ... It's amazing respect for what they're doing, and it's an eye on that, because we want to be recognized as to what they're doing and how that works out, but also understanding what fits for us. And what we can take, from not only that space, but other categories as well. So if you asked this five years ago, what categories would we be talking about? Mattresses and socks? I don't think those would be the top of the list. Dave Knox: What space are you hoping somebody just comes up with something, one of those challenger brands next? I think that the world of automotive is about to have its absolute clock ... Just, it's world rocked. The little things that are happening in ground swells to where, you know, down in Atlanta, I can go over to the mall, and I can buy a Tesla, and I can look at it and do all that. That's one thing. But when you look at the role of tier one, tier two and tier three, it's just not a sustainable model. I think service is really going to be the factor that's really going to explode. But the buying and selling of automobiles is going to just, the next few years are going to be a very interesting time for that category. Because the manufacturers are starting to look at this and go, hmm, these guys can do this and all you need is a footprint. I was overseas this weekend, and you could be walking down the street, and there's a Renault dealership that's literally stuck between the Nike store and the Izod store. So that whole category, I think, has just ... And there's so much, so much bloat in it, that I think that it's just, it's about time that something's going to happen. And there's too much money in it. Yeah. So, are we going to be driving 3D printed cars, here? At some point? So, final question for you guys, because I know you have to get up and take stage soon. What's the future marketing look like to you, and where are you most excited in terms of emerging markets, channels, tools, whatever have you? Yeah, I think the future of marketing to me is just about innovation that creates simultaneous value across every stakeholder group. You know, it's not just enough to position the brand and deliver great advertising. It really is about how you add holistic value to your employees' and your guests' lives across every touch point. And it's going to be more complex, and leaders in marketing are going to have to be up to the challenge of learning new fields and how marketing interacts with them. And being able to present persuasive arguments, like you alluded to, Jason, for business model innovation, in addition to other types of innovation. And I think in the end, it's going to be a business of finding new solutions to old problems and friction points that really creatively overcome trade offs. To me, that's really what innovation is about. It's about not accepting trade offs between the guests, your bottom line, franchisees, operators, etc. And how do you work to get a solution that leverages technology or some other tool, to solve it, to create that value. So I'm excited to be a part of it, but you know what? It's going to be even more ... It's a more challenging job than it was 10 years ago. I'll tell you, to me, the future of marketing is such an emphasis on growth. And having a growth mindset that is recognizing the challenges that we have and how we bring our communications to life, but it's that continuous focus on how can we grow? And it may be market share, it might be sales, it might be transactions, it might ... But it's having that growth mindset and feeding that in. And that's where, as I see this, we have a great example that we work with every day, in Rob Lynch, who, as our Chief Marketing Officer, led this incredible growth. And now as President, having that as a background, of understanding the consumer dynamic, the consumer marketplace, how all these feed in, has been a huge step towards then what that looks like for how we look at supply chain and all the other factors that go into that. So, I think that the marketing world is going to expand when it comes to growth, to understanding those other areas that are touch points that lead into that, because having that view and being able to recognize little market opportunities that affect change and drive forward, is going to be huge. And I'm an adjunct professor, and I teach a class called Digital Disruption in Modern Media. And I look at the students in there, and these are MBA candidates, so they know kind of what's going on. But as much as we see change on a daily basis, looking forward, the biggest opportunity that I can see, is in that system, to get them educated. Because the universities and higher education are not built to adapt to this. Having worked on curriculum for programs, and taking 18 months to get through this counsel for this counsel and this group, and then as soon as it gets approved, you have to change everything, because it's like, what you're learning as a freshman, by the time you're a junior, is gone and obsolete. And then, these governing bodies that say this is what the curriculum should be, and if you're going to get your certifications, you have to be this. It's a system that, like, we're not setting our own people up for success. And we see it, because we trying to basically train folks on the fly. But that core foundation of what marketing and especially leaning towards growth looks like, it's a system that needs a lot of help. One other thing to add to that, I think that we have to get better as marketers in the future. There's been so much emphasis put on big data, and I still think in the end, big heart beats out big data. And marketers need to figure out how to really bring to life compelling, emotional benefits, when guests interact with their brand. And I think that's been a little bit of something that's been a little bit of a lost art. So many times we start with the how, so much discussion about the how, and we don't go back up to the why and the who and the what often enough, and really think about the story arc that we're creating with the brand, and what can really engage and inspire people emotionally, to become attached and loyal to our brand. Thanks so much for listening. If you liked the show, hit that rating, and make sure to subscribe so you don't miss a single episode. And for more resources, head over to Predictingtheturn.com.